By 1979, nuclear war was deemed an imminent threat. The previous year the government had held a referendum on whether to have one and the majority of Scarfolk residents voted in favour, largely because they liked the siren and thought it sounded funny. They also voted for the 3 minute warning to be extended to 10 minutes so that older, frailer people could get to their windows in time to see the initial flash and subsequent mushroom cloud. A festive atmosphere was expected and party poppers sold out in anticipation of the countdown and explosion. The children of Scarfolk primary school painted their own post-detonation blast shadows onto walls around Scarfolk and instead of a traditional nativity play they put on a post-apocalyptic version in which the star was replaced by a missile, the donkey wore a hazmat suit and a glowing, malnourished Jesus and Mary were forced to eat Joseph after he perished from radiation poisoning. More nuclear war related public information HERE. For advice about what to do during catastrophic social breakdown go HERE. 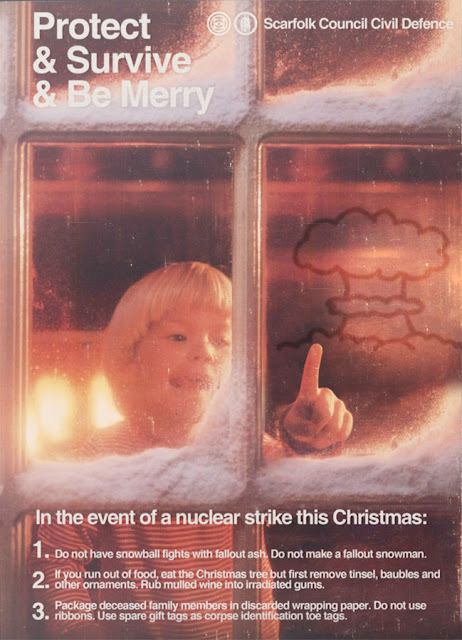 Merry Christmess and a happy new year from all the staff at Scarfolk Council. Some claim that movies have become mere advertisements for their own merchandising and that even before a film is released the public has been overwhelmed by a tsunami of branded products, from toys to clothing, watches and perfumes; food and drinks to firearms and trafficked children. 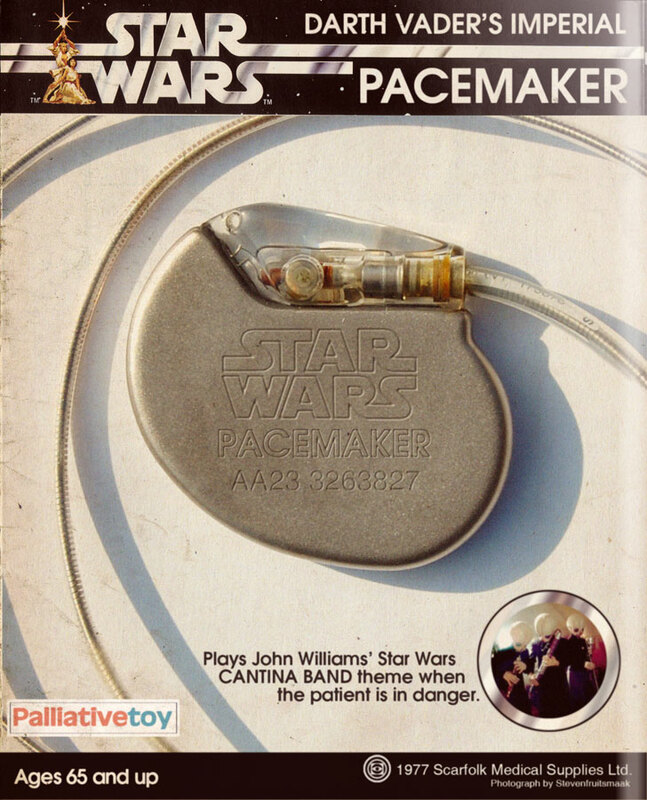 The original Star Wars film was one of the first to capitalise on its merchandising potential by producing desirable, limited-edition toys that children (and their parents) could never afford. 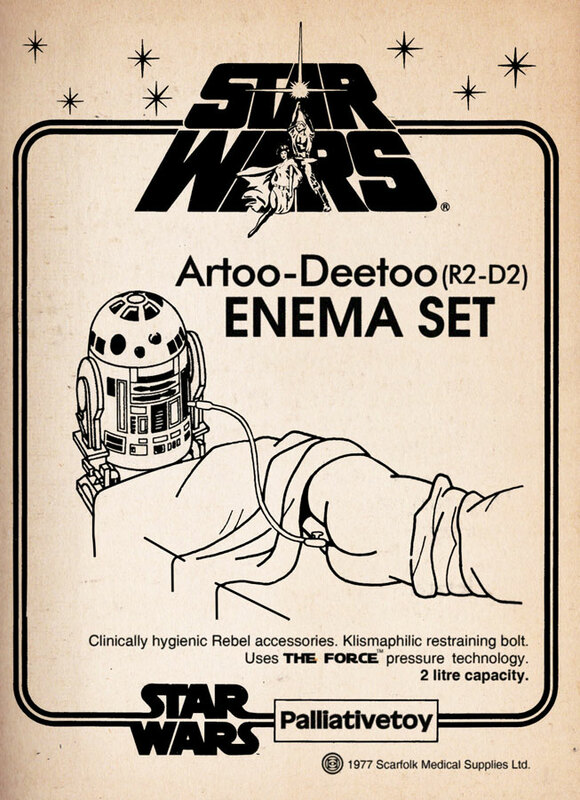 Even today, rare items such as the 1:1 scale, functioning Death Star can now reach upwards of £114 billion in auction, even more if it's still in the original box (batteries bought separately). Scarfolk Council wanted to nurture a generation of passive citizens so that it could do what it wanted without interference. But it was also fully aware that it needed to sell this passivity as positive action. A 1970 government leaflet (see above) stated that "urgent, active dithering is strongly recommended" and that "citizens should be single-minded about being in two minds. Resolute hesitation may or may not have made Britain what it is today." Dithering and faffing were also promoted in the media as attractive character traits and by summer of that year large DIY stores were selling specially-designed garden furniture to consumers who wanted to literally sit on their fences. 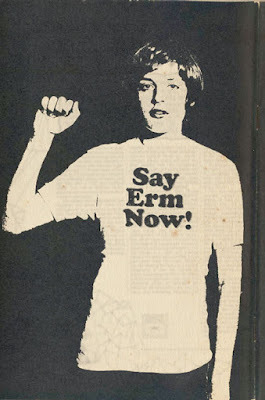 Student activists wore T-Shirts emblazoned with fashionable slogans such as 'Don't Go to War With Hem & Haw', 'Yes & No & Maybe' and 'Erm'. By the end of 1972, however, the state had become aware of the long-term physical and economic side-effects of sustained dithering. 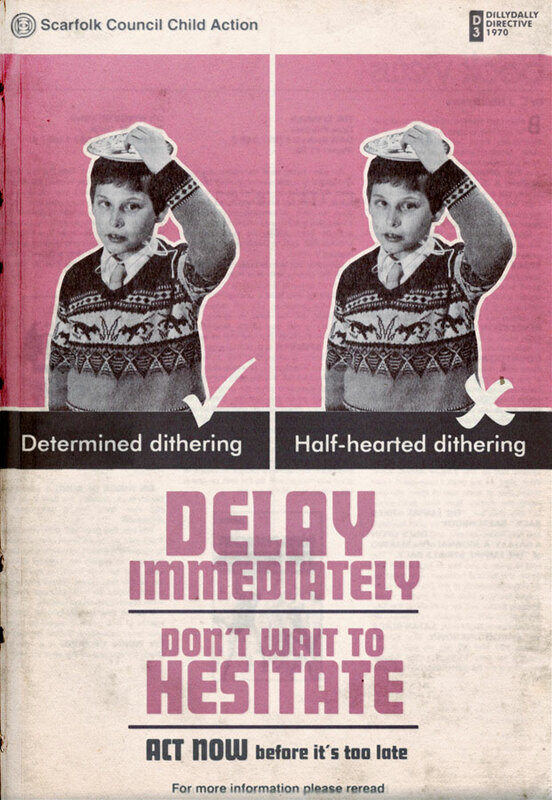 Unforeseen mass drooling, for example, cost the state hundreds of thousands of pounds in community bibs, and by 1973 the promotion of hesitation gave way to the more definitive 'Don't' campaign. 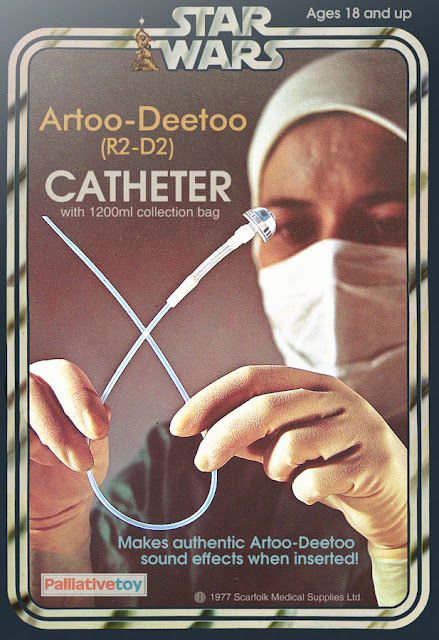 While Scarfolk Council did not officially endorse any religious denomination, many people felt that it strongly favoured the stationery and office-supply cult known as Officism (see Discovering Scarfolk for more details). In fact, several people in the upper echelons of local government were believed to be high-ranking members of the cult. The council's bias can be seen in this state-funded advent calendar, which was sold in Scarfolk in 1976. 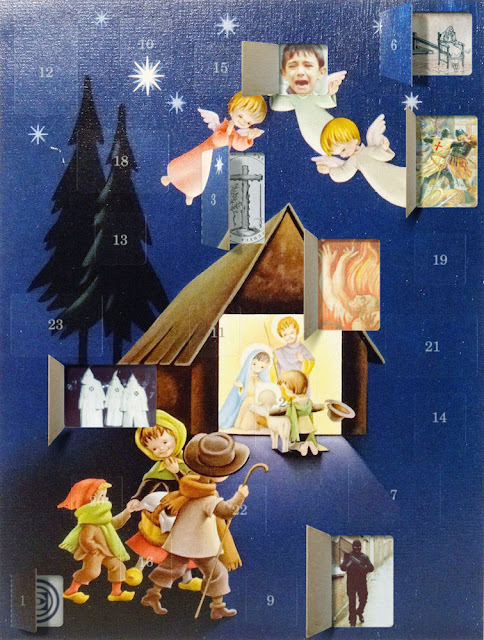 The intention of the calendar, with its images of religious violence concealed behind an idyllic nativity scene, was to undermine the spurious message of love perpetuated by the country's dominant religion. The calendar's violent imagery, however, was more attractive than the council had expected. Children wrote letters in their hundreds to Father Christmas asking for balaclavas, klan hoods, ducking stools and other torture instruments that hadn't been in use since the Spanish Inquisition. The Officist cult realised that to compete in the competitive market of religion, it would have to introduce its own brand of fashionable cruelty. Following months of market research and an intensive collaboration with an advertising agency, the cult came up with Torment Mittens™, which were cheap to manufacture but produced the right balance of physical pain, psychological distress and fear of the divine.